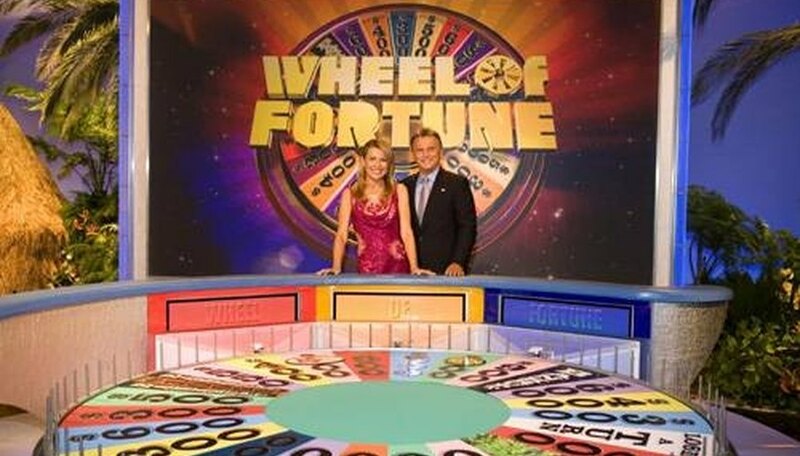 "Wheel of Fortune" has spent the better part of the last 25 years as America's most popular TV game show, with Pat Sajak and Vanna White becoming nightly fixtures in viewers' living rooms. While you can play along at home, enhance your enjoyment by playing the board game, complete with puzzle board and spinning wheel. Just as on the TV program, play against two players (or one), try your luck on the wheel, earn as much money as possible and solve word puzzles. After assembling the puzzle board and wheel, put a puzzle sheet between the backing board and back of the puzzle board frame. The black spaces below the sliding covers indicate letter positions and the number of words in a puzzle. Upon completing a round, flip the puzzle sheet around for the next puzzle. Have all covers in their "up" position before placing the sheet back in the board to avoid revealing the puzzle. If you act as banker, distribute money during a round (and collect money from players who earned money during a round but did not solve the puzzle). If you act as host, use the game booklet's letter frequency charts to cross-reference how often a letter appears in a puzzle and a letter's positions on the board. Mark letters off on the called letter chart. Whichever player spins the highest dollar amount goes first, with play continuing to the left. Note the puzzle type and spin the wheel. If you land on a dollar amount, guess a consonant. If the puzzle contains that consonant, the host slides the board squares down to reveal the letter, and you receive the spun dollar amount times the instances that letter appears on the board. For instance, if you spin $300, guess "r" and the puzzle has three instances of "r," you receive $900. If you guess a correct letter, either spin again, buy a vowel or solve the puzzle. Take no more than five seconds to ask for letters and 10 seconds to solve puzzles. Vowels cost a flat $250, regardless of whether the vowel appears in the puzzle or if the vowel appears multiple times. You can buy as many vowels as you like, as long as you have $250 for each vowel. If the vowel does not appear, your turn ends. Your turn also ends if you guess a letter that's not in the puzzle; you guess a letter on the called letter sheet; you spin "bankrupt" (you return all money you won thus far in that round to the banker) or "lose a turn" (play moves on to the next player); you guess a vowel without buying it; or you guess the incorrect puzzle solution. During play, you may land on "free spin." Take the spin token and continue your turn. If at any point in the game you lose your turn, you may use your token to spin again. Inform other players of your intentions to use your spin token. When planning to solve a puzzle, inform all players of your intentions to do so. Once you make your attempt, check the puzzle number's solution in the booklet, because the banker and the host may be your competition. If you have guessed correctly, uncover the squares and reveal the puzzle. Only you keep your winnings for the round. If you win a round with less than $500, the banker pays you the difference so that you win at least $500. If you have the most money at the end of four rounds, you win the game.